The new continuous coating system KTF-S is available with a working width of 300 mm, 450 mm, or 600 mm. 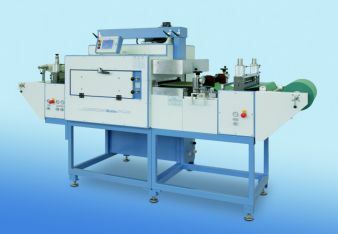 It consists of a doctor knife coating module and a subsequent drying unit and is ideally suited for various applications in textile industry, pharmaceutical industry or in research and development laboratories, where a larger machine cannot be operated efficiently. In the basic set-up the material is guided by an unroll device through the doctor knife coating and the drying unit. At the outlet the material is rolled up automatically. The heart of the system is the hot-air dryer, which is divided into two nozzle sections and two flaps to regulate the drying process accordingly. The combination of powerful air circulation and regulated heating guarantees an optimal drying capacity. Various add-on modules are realizable, e.g. an infrared pre-dryer, a laminating device or an additional hot-air dryer. Alternative coating devices can be used as well and also a discontinuous process is realizable. An optional infrared radiation pyrometer can be used to measure the surface temperature of the sample during drying process. All parameters are monitored seamlessly. Due to the modular design of the system all add-on components can be installed when needed. The KTF-S can combine with other system from Mathis.